Saxophone Workshop at Durlston Court School, Barton On Sea, Hampshire. W e are pleased to announce a three day saxophone workshop on 4th-6th August 2017 in Barton On Sea (Near Bournemouth). 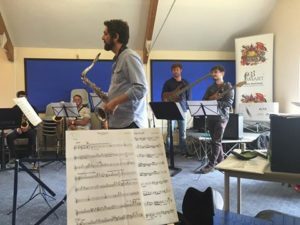 Do you want to improve your saxophone sound, sight read better, play better in tune, have real control over your saxophone, improve your improvising and theory and be part of a hard-working and enjoyable team of saxophonists for three days? If yes then join Andy Scott & James Rawlinson at JazzSmart on the 4th-6th August 2017, at Durlston School, for a three-day JazzSmart experience! 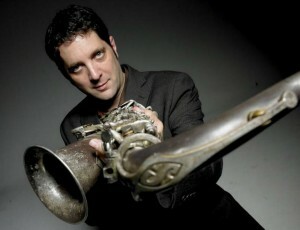 Andy Scott is a saxophonist, composer and bandleader who is well known to JazzSmart, having directed courses for many years. He is a highly-experienced educator, Tutor of Saxophone at the Royal Northern College of Music, who has developed and crafted his specialist Saxophone Days, directing them worldwide. Andy says “I’ve noticed on one or two day saxophone courses that there are simple and effective ways to improve our playing, maybe a different reed strength or mouthpiece, adjustments to embouchure, discovering the art of voicing and manipulating your basic tone, which all leads to feeling really comfortable when you play, and makes it more enjoyable for the people sitting next to you! In conjunction with James Rawlinson, himself a highly experienced performer and educator (The Red Fez Orchestra, Regular Joes, Forza Sax Quartet etc), Andy will develop a timetable that allows everyone to explore multiple performing opportunities – maybe you’re preparing for a music college audition or an exam, thinking of joining a band, have always fancied playing in a sax quartet, are someone who improvises but feels short of ideas, or a classically-trained saxophonist that would like to try to improvise. All this as well as playing together as a large ensemble will be covered in detail! If you have any energy left after all that then on Saturday night will see a trip down to Christchurch Quay to watch the Taverners Big Band performing at Stompin’ On The Quomps Jazz Festival. If you have any questions or queries about the course content etc. please email us for more details. 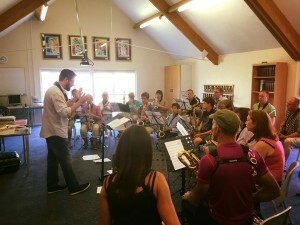 Priced at ONLY £199 for an amazing three day saxophone workshop including hot lunches and refreshments. Situated in the beautiful grounds of Durlston Court School with excellent facilities in a purpose built music block. Entry requirements Grade 3/4 level or above. Advanced players will still find themselves pushed with the repertoire available. Book online here.